I am totally over the moon for that color scheme!! Gorgeous! I should hire you to write my ad copy and take my photos! 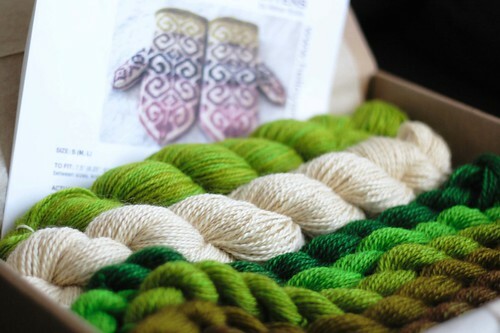 It is *almost* to pretty to knit - enjoy! GREEEEEEEEEN!!! these are going to be smashing. I was coveting Mafia's Greeeeen! Kit at SPA. Your photos certainly captures the color perfectly. Congrats on the acquisition! 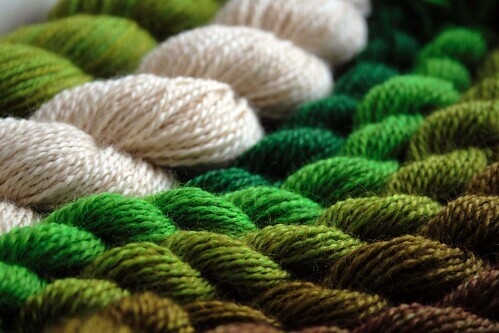 Simply gorgeous...I can't wait to see you knitting on them! OK, I've admired these on the Hello Yarn blog for while but now? Totally jading on them. Oh those colors! OMG, I just had to go and get the pattern for myself...no more kits right now!!!! So nice, can't wait to see yours!